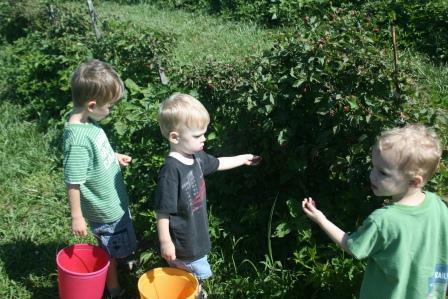 Last week the boys and I spent a morning in the berry patch, picking berries. While there, I told them that we'd make blackberry cobbler and blackberry jam from the berries when we got home. They eagerly picked munched in anticipation while I spent the morning filling a bucket with blackberries, blueberries, and dewberries. In case you've never heard of them, dewberries are like smaller, more tender blackberries. I actually like them even better than the blackberries. Once we got home, I rinsed all the berries and got to work. I used the same recipe for cobbler passed on to me by my mom. You know the one. Where you melt a stick of butter in the pan in the oven, then mix up 2 cups each of self-rising flour, sugar, and milk. Pour that on the butter and then toss on your berries and bake at 350* for an hour. It's one of those classic, never fail type recipes. My mom always made it with peaches. The dessert was pretty close to perfect when it came out of the oven. Gorgeous juicy ripened berries, lightly browned edges, the smell of sweetness. It just needed one thing to top it off. A dollop of COOL WHIP whipped topping. I've never made such a fresh blackberry cobbler before, because I've never picked my own blackberries. After tasting it, I can say that I'll definitely be repeating this! 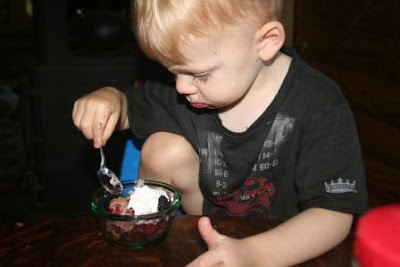 I love the COOL WHIP because it's light and fluffy and doesn't overwhelm the flavor of the berries in any way. Indeed, it just seems to accent an excellent farm fresh dessert. My boys loved getting to sample the fruits of my their hardworking berry picking efforts. They adore COOL WHIP and were excited to see it on top. Other than 'yum yum' noises, there wasn't a lot of talking going on during dessert. They were way too busy eating. 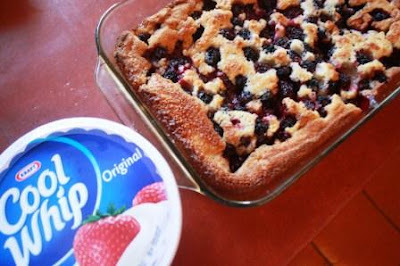 As a busy mom, I like that COOL WHIP is an easy touch to give a simple dessert that extra oomph. A homemade blackberry cobbler with a dollop of COOL WHIP like this? I dare to say - better than anything we could've hoped for in a restaurant. Perfection! Oh, yum! That cobbler is perfection! This looks delicious! How fun it must have been to pick your own berries! If I were eating some of that, I would be making yum yum noises, too! It looks delicious!! Yummo! Glad the boys enjoyed "picking" the fruit that went in their dessert! But it looks like eating dessert was more fun! I am curious as Blackberries in the hedgerows aren't ripe here until late August/early September and we are on about the same latitude.Great looking cobbler. Berry picking with your children had to be memorable! And such great desserts! Have you read the children's book BLUEBERRIES FOR SAL? With bears in your neighborhood (?! ), it's a perfect book to share with young children at berry-picking time. It's an older book, but a real classic! i almost skipped this post, just seeing your title - i knew you were going to kill me!!! LOVE bb cobbler! ooohhh that looks so good!!! Your boys are adorable!!! I know those berries were delicious and the photos of your boys are precious. We enjoy Cool Whip, too, but lately I cannot find the sugar free CW in any stores. Perhaps, they have discontinued it. (hubby is diabetic) I would make him sugar-free chocolate pudding with CW on top! Mmmmm. 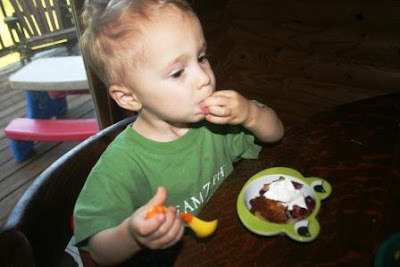 Your kids have convinced me that I NEED some blueberry cobbler NOW! I agree 100% about cool whip...it is a nice touch to ANY dessert! Oh that looks good! I love cool whip too. I buy it on sale and freeze it so I have it when I need it. Well those boys of yours are sure enjoying the cobbler. Looks good. me again.....we went to the local farmer's market this afternoon and I bought blueberries to try your cobbler recipe - THX! When I was pregnant with my 3rd child, I went through a trimester of craving where I ate a small container of Cool Whip (right out of the tub) almost every day. I have never heard of dewberries!! The boys do look like they are really enjoying this! I don't think I have ever had any dewberries. 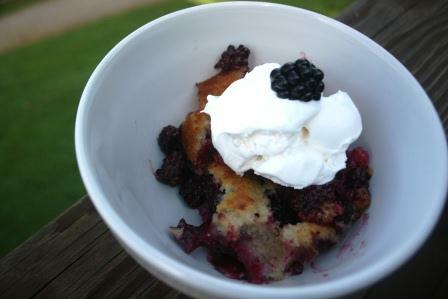 blackberry cobbler is on of my favorites! Yours looks delicious!!! Your triple berry cobbler does look delicious! And I always use Cool Whip too. The little guys sure made good helpers. Did they eat more than they saved? Oh it looks so good. Our berries are not ripe until August or September also. My sisters and I used to sneak bites of Cool Whip right out of the container. We liked it better than ice cream! I'd like dewberries better too. We have blackberry vines in our yard and the seeds can be a bit overwhelming sometimes. Looks delicious. 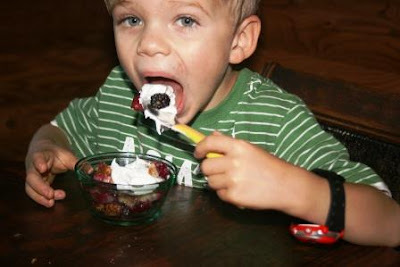 I love blackberries they are my favorite berry. Oh man, that looks SOOO good! !